Gourmet Blend features a tasty and colorful mix of five looseleafs in shades from green to red and textures from oakleaf to tightly ruffled. Fast-growing, tender, colorful and tolerant of hot weather, our popular looseleaf blend is selected for a long harvest. Grows best in cool weather and can be planted in early spring or grown as a fall crop. Protect from heat with shade cloth. Likes fertile soil, ample water. Best when picked minutes before your meal. Space lettuce plants 8" apart. Lettuce, Gourmet Blend is rated 4.8 out of 5 by 10. Rated 5 out of 5 by Jo3042 from Great taste I planted this early spring and then did several plantings at 7 day intervals. This is the best tasting lettuce! However I did plant it in July and it did not even sprout....it was really hot at the time. Will plant early again next spring. Love the different variety of the lettuce. Would definitely recommend. Rated 5 out of 5 by Sr Gardener from Excellant Variety We planted the first bag of seeds in beginning of May and had salad from end of May to beginning of August. There was enough lettuce to feed 2 families many salads during the week. Ordered another pack to plant end of August for a fall harvest & not one seed came up. Do not know what the problem was but was very disappointed. 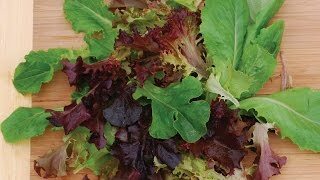 Rated 5 out of 5 by Jardin from Best looseleaf lettuce I growed this gourmet lettuce for the first time this spring and I was very impressed with it. Planted it in late spring due to renovation of my garden and we harvested from June till mid August. Planted again in the same spot and we still harvest to this day and looks really well. It is very tasty but you know how taste may be different from one person to the other. Also it has shade after 2 PM which helps cool it down in the middle of the summer. We used it in salads toghether with tomatoes, cucumbers, scallions, avocadoes etc. Highly recommended to anyone. Rated 5 out of 5 by TNgardener from Fantastic crop! This is my first time growing lettuces. I'm very happy with the Gourmet Blend. It looks like every seed sprouted, even the ones I accidentally dropped outside the garden. In no time at all, there were beautiful leaves to harvest, and the salads I've made with them are delicious and healthy. A lot of my other crops have been plagued by insect pests, but these lettuces don't seem to attract any pests at all. 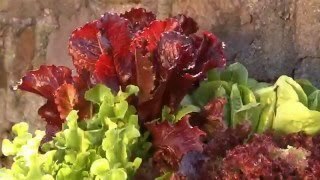 It's mid-October now, and the weather is turning cooler, but we've had no frosts yet, so I don't know how the lettuces will perform after a frost. My family is certainly enjoying them for now. I will definitely grow these again next spring. Rated 3 out of 5 by Katalou from Not totally successful I've done 3 plantings of the variety so far this year. The early spring planting did not germinate well, 2nd planting was a bit better, and the 3rd planting came in very nicely. However, only 3 varieties of the 5 promised have grown. There's much light green oak leaf, some red oak leaf and some curly Romaine with red tinged edges. I'll plant some more for the fall. Rated 5 out of 5 by Neillb from Keeps on coming Whilst the varieties do mature at slightly different times, successional sowing will still permit a full mix in each salad bowl. I sowed thinly last year, 3 times & still have some seeds for this year plus in marginal garden self seeded. We have a good wild lettuce bed in our abandoned garden patch! These add a little style & taste to any meal. Rated 5 out of 5 by Kendra from Very nice Great tasting and grew very well. We could've done a few plantings of these so we could have fresh salad all summer.